Mazda6s have broken 20 FIA speed records (subject to FIA homologation) at the ATP test oval in Papenburg, Germany, one of them averaging 137.37mph over 24 hours. 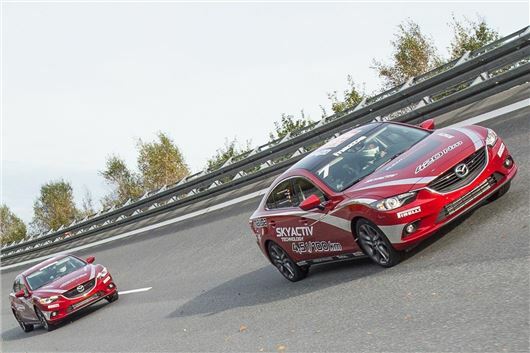 Three Mazda6s powered by 129kW/175ps SKYACTIV-D 2.2-litre clean diesels completed a 24-hour marathon on Sunday 19th October with the lead car achieving an average speed of 137.37mph and the other two close behind. The previous record for diesel-powered production cars of 2.0-2.5 litre displacement was 130.38mph. Each of the three Mazdas also set several other average speed records over a variety of distances (subject to FIA homologation). At the wheels of the cars, which covered more than 3,293 miles during the 24-hour period, were 23 drivers from seven EU countries. They included professionals as well as journalists and car enthusiasts, who could apply to take part as part of a campaign started by Mazda in May 2013. During their 1.5-hour stints behind the wheel, they were not allowed to follow in the slipstream of a preceding car and needed to be exceptionally careful in the steeply banked curves at each end of the oval to avoid losing speed. Nevertheless, only 0.55mph of average speed separated the three Mazda6s after 24 hours - a tribute to the drivers and pit teams, which were made up of employees from various Mazda dealerships, but above all to the design, drivability and dependability of these cars even when pushed to their limits. It would be interesting to know what the mpg was when traveling at those speeds. My guess would be 15 to 16 mpg? How many mpg did they get?